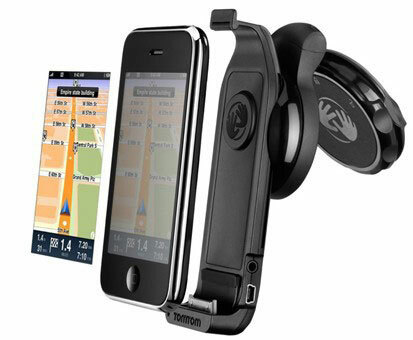 Last month TomTom announced their first GPS app for the iPhone, which weighed in at $99. That’s one of the more expensive pieces of software out there, though on-track with some of the other GPS offerings. When I wrote about it, I expressed my disinterest in such an application due to its high price and the fact that it would be a huge drain on your phone’s battery. Sure, TomTom made mention of a Car Kit, which is basically a mounting kit for the phone which also serves to charge it. The real question was just how much this would cost you. Well we finally have the answer to that question, and it’s just plain ridiculous. TomTom has announced that the kit will be available next month for the price of $120. To give you an idea, you can purchase the TomTom ONE XL for the exact same price. This device has a larger display (4.3-inches compared to the iPhone’s 3.5-inch screen) and as far as I can tell, all of the same features that are included in the iPhone app. So at the same price it might be a toss-up for some people, as having a full-fledged GPS application on the iPhone might be appealing. Here’s where it gets really fun though. That $120 price does not include the software. That’s right, you’ll still need to pay $99 for the application. I really don’t know who was in charge of this over at TomTom, but they should be sacked. They’re offering all of the functionality of a $120 device for $220, and you have to supply the most important piece of hardware. I love my iPhone and all, but there’s nothing that could convince me to drop the cash on this grossly overpriced pair of products. Owners of TomTom GPS navigation units that are tired of the plain, boring voices that the systems shipped with can now get Mr. T’s voice on their TomTom GPS system thanks to Navtones. Don’t miss a turn with Mr. T as your navigator sucka! I pity the fool who gets stuck in traffic. If 80’s TV series stars aren’t your fist choice to tell you when to turn as you go about your travels, Navtones also offers Gary Busey, Burt Reynolds and Dennis Hopper celebrity voices along with a slew of non-celebrity voices to choose from. The Premium celebrity Navtone voices cost $12.95 each and there are two versions available, one called funny and the other called standard. You can also buy both versions of one voice for $19.95 or get Dennis Hopper, Burt Reynolds, and Mr. T all for $29.95.